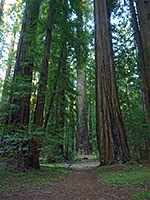 Montgomery Woods State Natural Reserve is one of the least known of around 30 redwood parks in California, partly on account of its rather remote location, well away from major highways, yet the trees here are comparable in size to the more famous locations further north, and the place is very quiet and atmospheric. 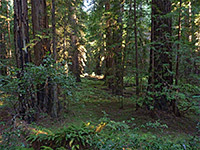 The old growth redwood grove extends for over a mile along Montgomery Creek, a tributary of the South Fork Big River which forms a deep, sheltered, steep-sided valley, angled northwest-southeast, centered on a half mile-long alluvial flat, were the largest trees are found. 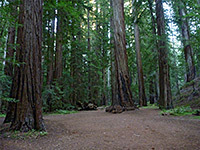 At one time the grove contained the tallest redwood in California (the 367.5 foot Mendocino Tree), though its location was kept secret, and taller specimens have since been identified in the Redwood National Park region further north. 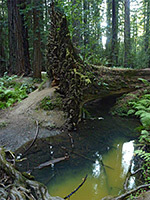 Montgomery Creek is relatively far from the Pacific Ocean compared with most redwood habitats, so coastal fog - an important addition to the trees' water supply - is not so prevalent, but the deep valley holds moisture well, and the year-round creek allows the trees to flourish. Also unlike many other famous groves, the trees are well away from the highway so are never affected by traffic noise. The park has no entrance fee and no facilities beyond a parking area and a three mile loop path, reflecting its designation as a state natural reserve rather than a state park. The boundaries include hilly land to the north and south, but there are no trails here, and all visitation is confined to the grove along Montgomery Creek. The hidden setting is the reason why the trees have never been logged. 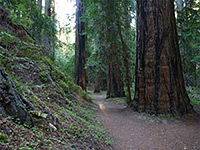 A paved route runs through the park - Orr Springs Road, one of the few connections between Hwy 1 along the coast and US 101 inland. The road starts in the east at Ukiah, reaching the park after 14 miles and continuing another 30 miles to Mendocino. The eastern section leaves US 101, crosses a thin belt of farmland at the edge of the Central Valley, and climbs up a long, narrow ridge, initially forested, later largely treeless - rolling, grassy hills with very little sign of habitation. A steep, switchback descent leads to the upper end of the valley of the Big River, pass the tiny settlement of Orrs Springs (a hot spring resort) and into the reserve. The western approach from Mendocino is equally little-traveled, and the journey takes longer than might be expected since the road is variously steep, bendy, narrow, and has an uneven surface. The road climbs to a flat-topped hill, descends to a village, rises again and winds down a valley to the slightly larger settlement of Comptche, after which the road narrows and becomes very winding, eventually meeting the Big River, and following this through a mix of fields and dense woodland; most is composed of regular trees (Douglas fir) but with occasional small size redwoods, and a scattering of huge stumps from long ago-felled giants. 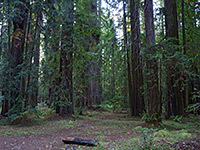 The grove is situated along the short drainage of Montgomery Creek, near the upper end of the Big River valley, at an elevation of 850 feet, and is in full sun for a relatively short time in the middle of the day, becoming quite dark by late afternoon. The parking lot, on the south side of the highway, can accommodate a couple of dozen vehicles though usually just one or two are here. The path first crosses the creek then meets an old roadbed which ascends briefly but steeply up the hillside. 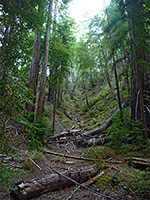 Another minor path joints from the west, just after a short descent, while the main trail drops down a little further to the edge of a level area (Montgomery Flat), at the northwest end of the redwood grove. A few benches provide places to rest, and some of the trees have memorial plaques. The loop section of the trail continues, further into the grove; the main route stays on the south side of the creek, passing many huge trees, often splayed out at the base. Some are fallen, a few fire damaged but most are healthy and unharmed. 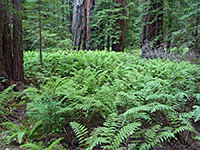 The initially bare ground soon gives way to a 'fern forest'; an even covering of equal-height plants, the most common species being the giant chain fern - others include goldback fern and western sword fern. The path rises slightly, just enough for good, elevated views of the grove, and descends to a bridge over the creek, marking the far side of the loop. 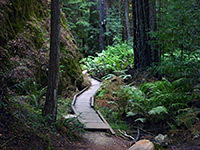 The return is closer to the steep slopes on the north side of the stream, through somewhat moister surroundings, and the path is assisted by a wooden boardwalk through one particularly boggy section. 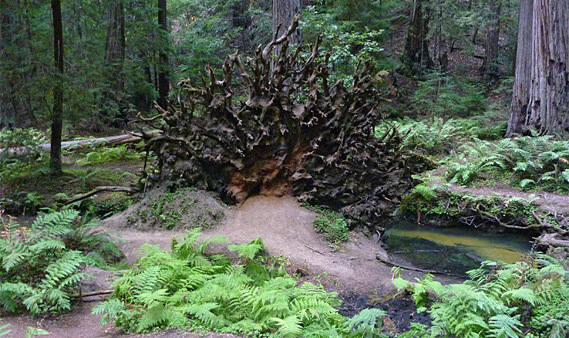 The trail comes close to the stream, which forms a few greenish pools, one beside the big, twisted roots of a fallen tree. The last section crosses flats in the middle of the valley, back to the entry path at the edge of the grove.